For occasional travel insights and ideas delivered to your inbox. As if the ornate facade wasn’t enough, the inside of Basílica de la Sagrada Familia is packed with history, symbolism, and one-of-a-kind Antoni Gaudí designs. 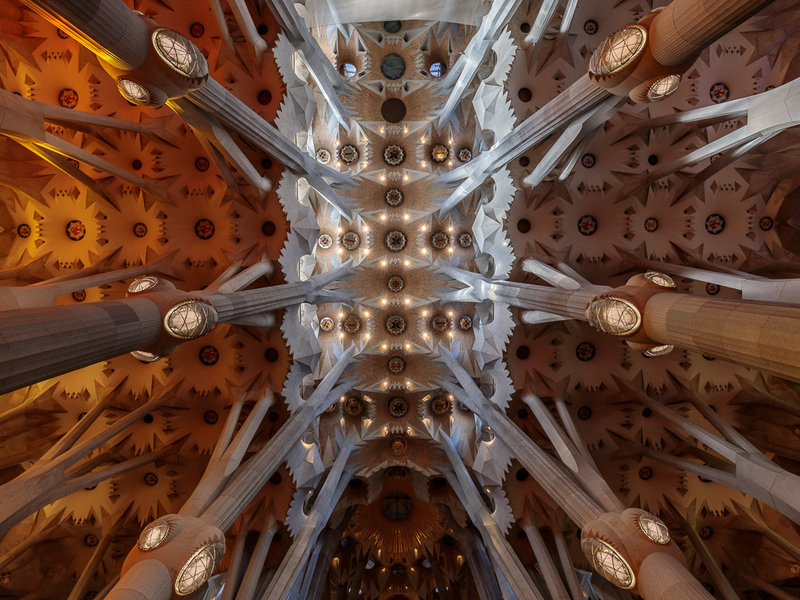 This breathtaking Barcelona landmark—which is only at 70 percent completion and under construction until 2026—remains one of the best examples of modern art and design in the world. But if you’re too busy gawking at the grandeur of church’s facade, you’ll miss the hidden splendors found in the Sagrada Familia interior that showcase Gaudí’s relationship with God and architecture itself. As is common with many churches, the Sagrada Familia is, from a bird's eye view, laid out in the shape of a cross. Its three grand facades—the Nativity façade to the East, the Passion façade to the West, and the Glory façade to the South—double as entrances (or “portals”) into the church. This gives it the overall structure and shape, and doubles as a religious nod, too. Gaudí wasn’t a fan of convention, which meant that he steered clear of any traditional Gothic-style elements that would take away from his artistry. Buttresses were the first to go. Instead, he created columns made of red porphyry and basalt in the shape of tree trunks to make visitors feel like they were deep inside forest rather than a Roman Catholic church in the heart of Spain. To give them more depth, the columns branch out to give an illusion of palm trees as they work their way up to the ceiling. As a rule, he avoided straight lines and angles in the Sagrada Familia interior to give it a more natural feel. The columns themselves weren’t merely simple structures to Gaudí: their unique double twist design symbolizes the saints ascending into heaven and the angels descending to meet them. The lamps on each of these 36 columns gives greater context to the meaning of each structure. The four columns in the center of the church’s transept, for example, are in honor of the Evangelists. Their symbols—winged man for Matthew, winged lion for Mark, winged ox for Luke, and eagle for John—can be seen on the lamps, which illuminate the Sagrada Familia interior with rainbows of light once the sun sets. The remaining columns are dedicated to the twelve apostles, four Catalan bishoprics, 15 Spanish cities with archbishoprics, and five continents (Antarctica and Australia are excluded). On each lamp, there’s an intricate illustration of the patron saint of its diocese to bring color to the church. Vibrant stained glass windows give the church its other main source of light. In addition to the color and light they bring to the Sagrada Familia interior, the windows set the mood depending on what area of the church you’re in. On the Portal of Nativity, there’s yellow, green, and blue glass to symbolize the birth of Christ, poverty, and light. 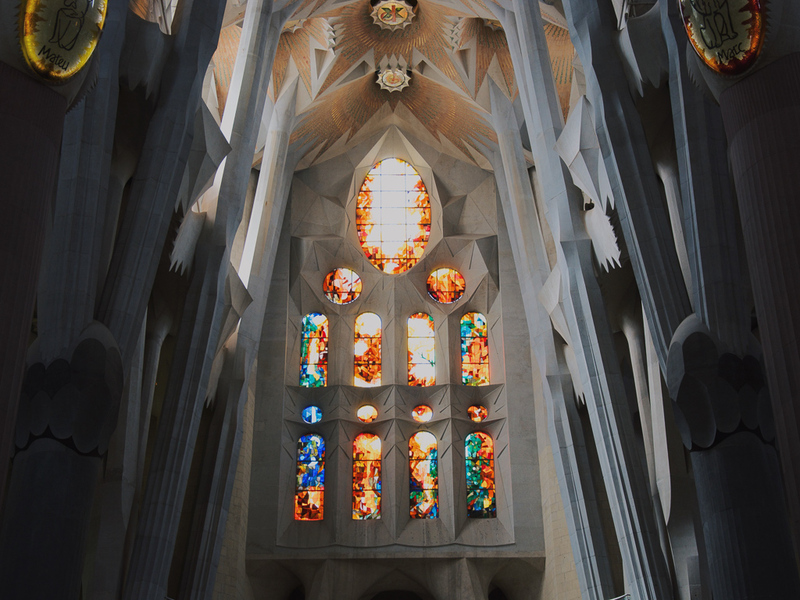 The bolder yellow, orange, and red windows on the Facade of the Passion allude to water, light, and resurrection. Both, however, convey strong emotions … and dare we say, passion. Of course, there’s rhyme and reason behind the placement of the windows themselves: The glass is transparent on top to illuminate the church, while deeper hues work their way down the facade to create an appropriate setting for prayer, meditation, and reflection. Sandwiched between two columns representing St. Peter and St. Paul is the Sagrada Familia's High Altar, made from a giant block of porphyry from Iran. Above the alter, a bronze Crucifixion of Christ is descending from the ceiling. The cross is surrounded by an elaborate canopy, which is the replica of the one Jujol made for the Cathedral in Mallorca. As a subtle nod to the traditional church design, Gaudí decorated the canopy with vines and grapes of vine. If you look beyond the canopy, there’s a golden mosaic dome overhead. Not only does the mosaic illuminate the Sagrada Familia interior but it also represents Catholicism as a whole: the mosaic depicts a triangle within a circle, which symbolizes the Holy Trinity as a part of the greater world. If you see a mosaic “JMJ” on Sagrada Familia’s interior and exterior, there’s good reason: it represents Jesus of Nazareth and his parents, the Virgin Mary and Joseph of Nazareth, as a family. You’ll spot it on an outside medallion, on the floor of the Temple at the center of the crossing, on the prie-dieus in the first row of the pews, in front of the presidential chair in the presbytery, and even on the Glory façade. The “M” is made up of three vertical white stripes with a white vertical stripe on each side for Jesus and Joseph. The “J” for Jesus stretches upward until it reaches the cross of Christ to form the letter’s shape. The “J” for Joseph, on the other hand, mirrors Jesus by stretching downward until it reaches a flower with a rod, which symbolizes the Saint. There’s a gold crown that connects the three vertical lines for “M” to symbolize Mary as a queen. Beyond the stunning mosaics, there’s another anagram above the painting devoted to the Holy Family in the museum at the Temple. Subtle and smaller in scale, this “JMJ” is made with wood and gold-leaf. Here, the “J” for Jesus splits into three, becoming the nails of the crucifixion, while the “J” for Joseph stretches down until it becomes a flower. Mary is still crowned the queen but in this case, there’s a circle around the three vertical lines that make up “M” to make it stand out. 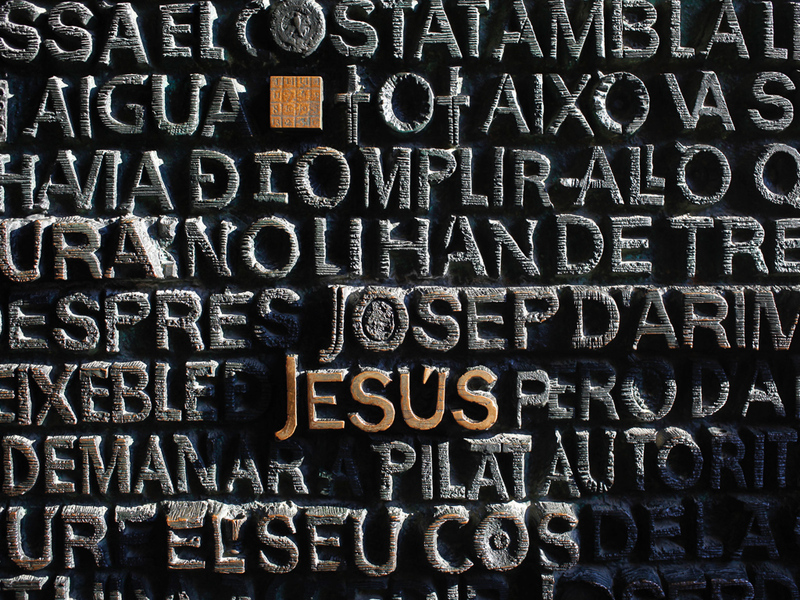 The entire anagram is framed by a rosary of sorts that appears to be the crown of thorns that was placed on Jesus’ head during his crucifixion. No Catholic church is complete without an organ. In this case, the organ wasn’t installed until 2010, more than 100 years after the church began construction. The size of the organ has to match the enormous size of the church: it has 1,492 pipes on two manuals and a pedalboard. Still, it doesn’t give off enough sound to reach the entire Sagrada Familia interior so there will be more organs installed before construction is completed in 2026. The only way to understand the beauty of the church’s unique Art Nouveau style and religious significance is to see it for yourself. You know what that means: A trip to Barcelona should be next on your list. And yes, even though the church is covered with cranes and construction until 2026, the Sagrada Familia interior is worth a trip. We promise.